We're very excited to be a part of this celebration. Please fill in the following details to help us best prepare for your day. Let us know of any questions you have and we would be happy to help answer them. We will have someone directing parking for an hour of arrivals. Which hour would you like this to be? If you've chosen to not have an event coordinator, please list designated family member or friend who will fill this role. This role exists so that we do not have to consult the couple for day-of questions. Email and Phone Number. I'll be sending them an email to commence communication between us. The email with include venue rules and regulations that you have in the contract so we're all on the same page. Clean up of the pavilion and any used spaces for wedding must happen within the rental time frame (ex. before 11pm.) Personal belongings and rentals must be picked up by 10am the following day. Failure to complete checklist will result in loss of security deposit. List of Hired Vendors - photographers, caterers, rental company, etc. How many cars are you anticipating? Have you hired a shuttle? If yes, specify company. What restroom have you rented? Was this through Wollam Gardens or an outside company? Have you rented a restroom through Wollam Gardens? Are we doing your flowers? Do you have your virginia abc license? Do you have day-of event insurance or does your caterer provide this? Where will tent be located? 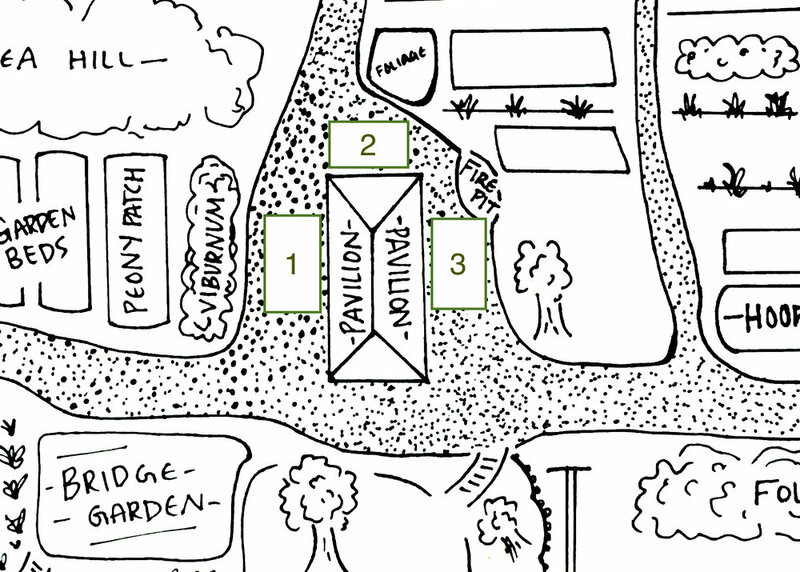 See map below and indicate placement as "1", "2", or "3" or a combination if using more than one tent. Please email itinerary to arrin@wollamgardens.com if you have one. Thank you! !